Experience massive low-end thunder in a compact package—at a steal! Ideal for little shredders, the new JS Series Concert™ Bass Minion JS1X features a shortened 28.6" scale length, poplar body, one-piece bolt-on maple neck with graphite reinforcement rods and a 12" radius amaranth fingerboard with 22 jumbo frets and pearloid sharkfin inlays. 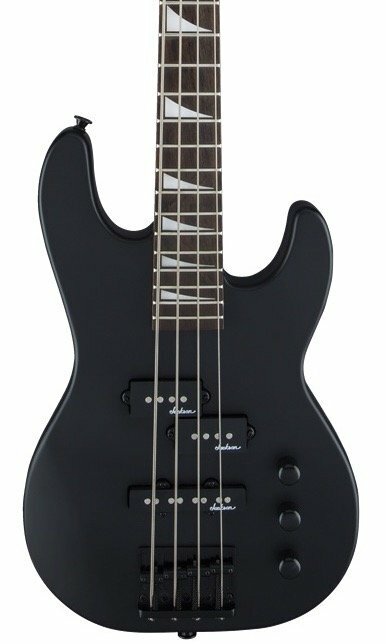 A Jackson P style neck pickup and Jackson J style bridge pickup power this 4-string bass, which also features a pair of volume knobs, hardtail bridge with black base plate and Jackson-branded locking tuners. The Concert Bass Minion JS1X is available in Neon Green, Pavo Purple, Satin Black or Satin Silver with black hardware.